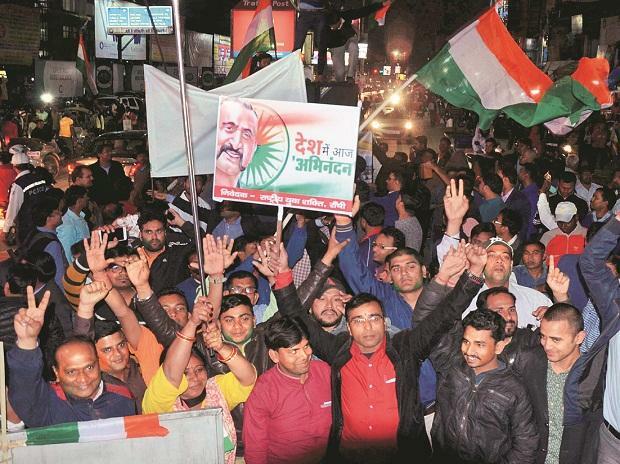 Leaders cutting across party lines welcomed the return of Indian Air Force pilot Abhinandan Varthman from captivity in Pakistan on Friday and lauded him for his poise and courage and for making the country proud. Prime Minister Narendra Modi welcomed the IAF Wing Commander, saying the nation is proud of his exemplary courage. He said the country's armed forces are an inspiration for the 130 crore Indians. "Welcome Home Wing Commander Abhinandan! The nation is proud of your exemplary courage. Our armed forces are an inspiration for 130 crore Indians. Vande Mataram," he tweeted. Defence Minister Nirmala Sitharaman tweeted, "Proud of you Wing Commander #AbhinandanVarthaman. The entire nation appreciates your valour and grit. You held your calm in the face of adversity. You are an inspiration to our youth. Salute. Vande Mataram. Jai Hind." Union Ministers Rajnath Singh and Ravi Shankar Prasad too lauded the pilot for his bravery and welcomed him back to the country. "Welcome home. The entire nation is proud of Wing Commander Abhinandan," Singh, the Minister for Home Affairs, tweeted. Prasad tweeted, "Proud of your courage Wing Commander Abhinandan! Welcome back home. Abhinandan to you. Jai Hind. Bharat Mata Ki Jai." BJP president Amit Shah said Friday that the entire nation is proud of the courage and valour of the pilot and that India is glad to have him back. "Dear Wing Commander Abhinandan, entire nation is proud of your courage and valour. India is glad to have you back. May you continue to serve the nation and IAF with unparalleled passion and dedication. Best wishes for your bright future," Shah said. Congress president Rahul Gandhi welcomed IAF Wing Commander Abhinandan said his dignity, poise and bravery have made all in India proud. "Wing Cdr. Abhinandan, your dignity, poise and bravery made us all proud. Welcome back and much love," he said on Twitter. Pakistani officials handed over Varthaman to Indian officials, including from the IAF, at the Attari-Wagah Border. Union minister Smriti Irani Friday credited Prime Minister Narendra Modi's "parakram" (valour) for Varthaman's return from Pakistan within two days of his capture. "Sangh (RSS) today can be proud of the fact that a son of India is returning to India in 48 hours due to the 'parakram' of a swayamsevak (RSS volunteer)," she said in an apparent reference to Modi. West Bengal chief minister Mamata Banerjee said, "Welcome home Abhinandan Varthaman Welcome home sweet home". Delhi chief minister Arvind Kejriwal, in a series of tweet, called the pilot an inspiration for the nation. "Welcome back Wing Commander Abhinandan. I salute your bravery and the courage of your family. "India is proud of you. The hero finally walks back. A grateful nation salutes Wing Commander Abhinandan. You are an inspiration for all of us," he tweeted. Andhra Pradesh chief minister N Chandrababu Naidu said,"Very happy to see the safe return of IAF wing commander Abhinandan. AP salutes the brave and spirited patriot." Former Jammu and Kashmir chief minister Omar Abdullah tweeted, "Welcome home Wing Commander. It's great to have you back." Rajasthan chief minister Ashok Gehlot tweeted, "Relieved and glad that Wing Commander Abhinandan Varthaman is back home. I welcome him on Indian soil and salute his valour. The nation is proud of its armed forces." The Congress also put up a picture of Abhinandan on its Twitter handle and tweeted, "Welcome home Wing Commander Abhinandan. We are happy to have you back. You have been a true hero to all of us. Salute. Jai Hind." RJD leader Tejashwi Yadav said, "India Salutes you Wing Commander Abhinanand! Welcome Back! You are the real hero." Punjab chief minister Amarinder Singh said, "Join the nation in warmly welcoming back our hero Wing Commander Abhinandan Varthaman! Your resoluteness and poise in the face of adversity makes me proud as an Indian and former soldier. Welcome back son! Jai Hind." Samajwadi Party chief and former Uttar Pradesh chief minister Akhilesh Yadav tweeted, "The nation salutes you Wing Commander. Welcome home!" CPI-M leader Sitaram Yechury tweeted, "Home, finally, Wing Commander Abhinandan! Welcome back." Maharashtra CM Devendra Fadnavis also tweeted, "Abhinandan' Bharat ! Our Abhinandan is back with us!" Karnataka chief minister H D Kumaraswamy said, "Extremely happy that Our Hero #IAF pilot Wing Commander #AbhinandanVarthaman is back. The grace, grit, and commitment he showed during the toughest time is really admirable. We are proud of him. The nation salutes his bravery. Welcome Home Abhinandan.